Chili recipes are one of those comfort foods I can’t live without. 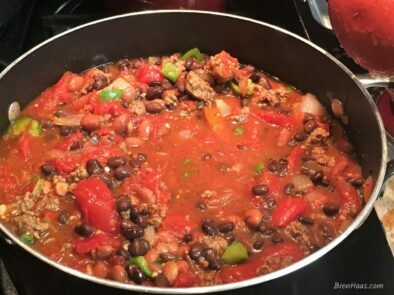 In today’s post be inspired to create a simple an super tasty chili recipe for your family to enjoy. In same pot move brown ground beef to the side and add onions and garlic. Saute onions and garlic - mix into ground beef. Push to side of soup pan. Add peppers saute for about 5 minutes before mixing with meat mix already in soup pan. Carefully pour in the stewed tomatoes. If you do not have roma use any other fresh stewed tomato you enjoy. Add the beans after draining to the soup pan. Mix well. Let simmer for about 30 minutes or until the chili is nice and bubbly. This recipe taste amazing with homemade corn bread or second day leftovers over your favorite pasta for a chili mac! Inspired by memories from my childhood and things that I grow in my home garden. Here are a few photos from the kitchen while whipping up this simple recipe. I used black beans and chili beans from Aldi for this feature. I really need to work on growing more beans in my home garden. made it easy for you to add this to your Pinterest board by creating the perfect image. Not sure how to add to Pinterest just be sure to contact me on my featured on this site. I would love to hear from you so please be sure to connect by sharing on social or reaching out on my contact page. 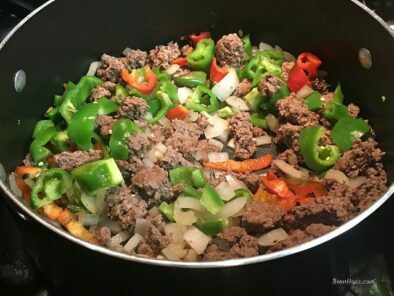 I’d love to hear about your favorite chili ingredients you use.